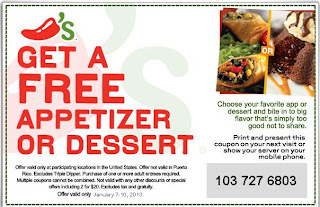 Free Appetizer or Dessert at Chili's with this coupon. Offer value January 7-10, 2013. Print the coupon and take it in to your nearest Chili's to enjoy your dessert or appetizer.